The attached article was published at horsesmouth.com on 5/2/2013. 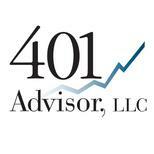 While the market continues to show technical strength, key economic data is deteriorating. While we remain fully invested, we are rotating portfolios to lower risk holdings. The data looked good until the last half of April. Now the five factors needed for a continued rally have taken a decided downturn, prompting one advisor to move into a low-beta strategy and collect dividends over the summer. His advice? Watch SPLV and JNK very closely. Recently we’ve seen a turn in economic data that may be showing a soft patch ahead for our economy. But with a plethora of data to choose from, which data really matters? In the past I’ve used a study by Citi equity strategist Robert Buckland that suggests that after a significant increase in the market, there are five factors that determine whether an existing rally can continue. But before we look at that data, let’s first take a quick technical look at where we are according to three indicators: SPY (SPDR’s S&P 500 Index tracking ETF), SPLV (PowerShare’s S&P Low Volatility Index tracking ETF), and SPHB (PowerShare’s S&P 500 High Beta Index tracking ETF). 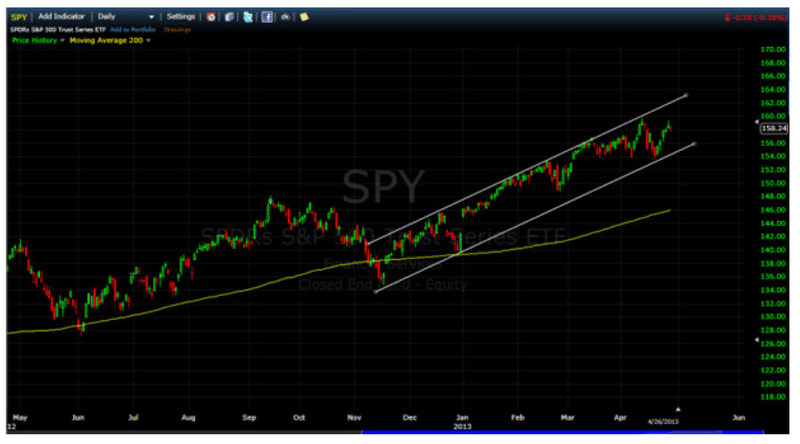 Below is a year-to-date candlestick chart of SPY, with the 200-day simple moving average (SMA) in yellow. SPY is clearly trading well within its uptrend—as indicated by the white lines—which started in November of 2012. Despite the media’s Chicken Little reaction on every down day, the candle chart provides a quick visualization showing that volatility also appears to be well within a “normal” range. And, finally, SPY is trading well above its 200 SMA, a common indicator of the strength and future direction of the market, as long as the 200 SMA also continues to show an upward trend. In Figure 2, below, I’ve added SPLV (yellow line) and SPHB (blue line) to the graph of SPY (green and red line). I’ve also changed the time frame to a year-to-date view. 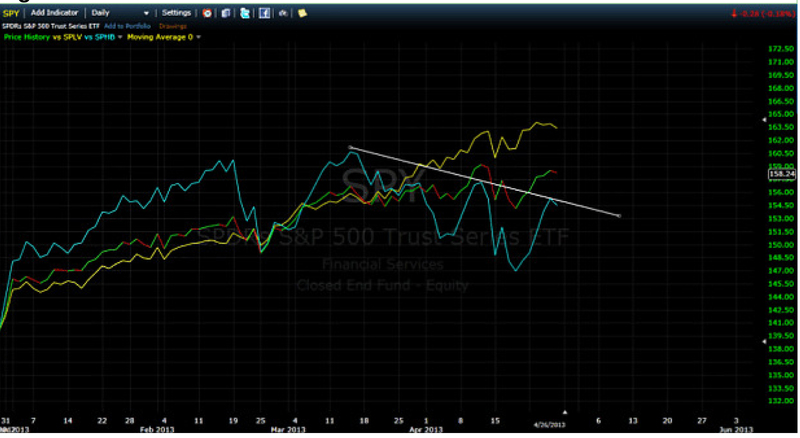 The white trend line shows that SPHB has turned negative since about mid-March, while SPLV has continued to show gains. The result has been a relatively flat SPY. This shows a definite rotation from riskier high-beta stocks to lower-risk, lower-volatility stocks. While this is a “risk-averse” move, it is significant that SPLV is still showing a positive trend. Investors to do not appear to be concerned about a broad market sell-off but are apparently (and logically) looking for the lowest-risk securities—probably as an alternative to near-zero-interest-rate bonds. More dividend-paying securities will be in the SPLV index than the SPHB index. This is a graph I look at on a weekly, if not daily, basis. We moved out of SPHB and into SPLV for our Seasonal ETF strategy at the beginning of April. I will get very defensive if SPLV starts showing a downtrend along with a continuation of SPHB’s down trend. While a rotation from SPHB to SPLV could just be an indication of investors looking for yield, it could also be an early warning sign of bad things to come. Do the fundamentals warrant a continued rally or a sell-off? Lower-than-average starting valuations: Neutral. Reuters dropped 2013 earnings projections to $114.01. This gives the market a 13.9 forward P/E—a decidedly average number. I lean to a neutral position because historic low interest rates would normally account for a higher P/E. Double-digit EPS growth: Fail. Year-over-year earnings growth is now projected at a paltry 3.75%. Zacks.com estimates that top-line revenue growth will be flat for Q1 2013. Rising PMIs: Fail. Markit Flash PMI came in at a 52 reading on April 23. While still a positive number showing economic expansion, it is lower than the previous reading of 54.6. Higher U.S. government bond yields: Fail. The yield on the 10-year Treasury has dropped from about 1.88% to 1.7% in the month of April. When I looked at this data in February, all five criteria were positive. Looking back at the economic report tables, I’d say this data has been fairly positive until just the last half of April. And that’s the problem with economic forecasting. At inflection points, it is impossible to know whether or not a turn in data is an aberration, a temporary blip, or the beginning of a trend reversal. The one point that keeps me mildly optimistic is that virtually every forecaster predicted a soft first quarter for 2013. So this has not been a surprise. I follow the “sell in May” strategy supported by The Stock Trader’s Almanac and their research. However, we use a low beta strategy instead of cash for the “go away” period. As I noted earlier, we replaced SPHB with SPLV a month ago. I would expect that we will have completely rotated into our summer low-beta holdings by the end of the week. For our dividend portfolios, we have already adopted a low P/E screen to our holdings. I hope that a relatively low valuation and high dividend yield combination will prove to be a solid defensive strategy as well as providing reasonable gains over the next several months. For our seasonal strategy, we simply will not get more aggressive until the October/November time frame. We’ll collect dividends over the summer. However, we can—and will—get more defensive if conditions warrant. At this point, I am watching SPLV very closely. If it establishes a negative trend along with SPY and SPHB, I will be very concerned. I would look at the equity fund flow data to confirm that interest in stocks has waned to dangerous levels. In our dividend strategies, I hold JNK (SPDR Barclays Capital High Yield Bond ETF) for a combination of yield and as a tactical position. JNK continues to provide a slow but steady appreciation in its NAV. However, I am very nervous when high-yield debt is only paying a 6.01% yield (JNK yield from MarketWatch.com as of 4/28/2013). If JNK stalls or turns negative, we will move this holding to cash very quickly.